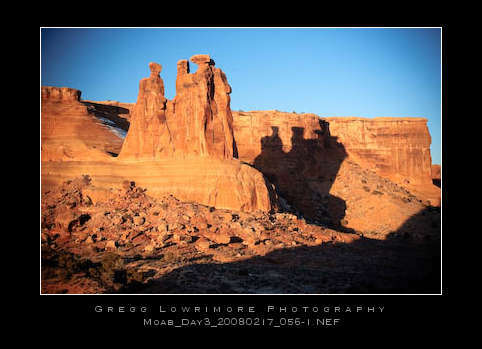 Steve Parker and I had been talking about a photo trip out Moab to shoot Arches NP and Canyonlands NP for several years now. Schedules, timing and whatever, always seemed to get in the way…. Well, we finally made it happen this past February and we even coerced our friend Lori Stone to fly out from Seattle to join us! What follows are some highlights from this photo excursion. Let me know what you think. We started off for Moab, Ut at 10:45am on Friday morning, hoping to beat the infamous President’s Day Weekend ski traffic. After a bite to eat and road trip munches, we headed up the hill and across Colorado, arriving near Moab about 5:15pm that afternoon. What we were striving for was some type of sunset location in Canyonlands NP, so we immediately headed into the park to see what we could find. Not really knowing what to expect and Google Earth doesn’t quite give one an accurate “depth” to what was in store for us. (Hindsight’s 20/20). After shooting near the entrance, we ventured deeper into the park, thinking let’s head to the Visitor’s Center and pick up some maps and maybe get Lori’s National Parks passport stamped. By then, the center was closed and the sun was sinking fast! But right across the street from the Visitor’s Center is a little trail that looked promising, so Steve, Lori and I headed down for a closer look. I’m in my Crocs and not really properly dressed and it’s getting colder by the second. Walking down the trail about 20 yards, I hear Steve talking to himself, “Oh?”, “Oh my!” and “OH MY!” and then finally “Oh my GOD!” (clean version). This little trail brought Steve and I out to the edge of this bowl, looking out over the Colorado River and the La Sal Mountains in the far distance. 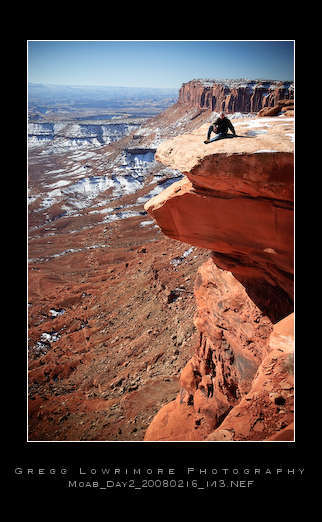 Dead Horse Point was off to our left and the valley floor was about 1500 feet straight down about 2 feet in front of us. Yeow-za. Some 10 pictures there at about 20 seconds a piece and I was cold and weary enough to want to head back to the truck. I don’t think Lori ever made it any further out to the edge than in this picture and this as taken about 20 yards back from the edge. Next we decided it was time to grab some food and locate our condo. 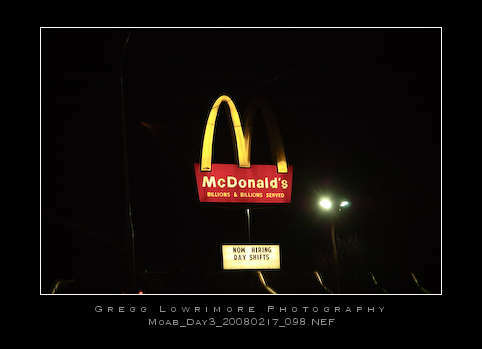 We had heard that everything in the town of Moab was based upon how far it was from the McDonalds on the main drag. 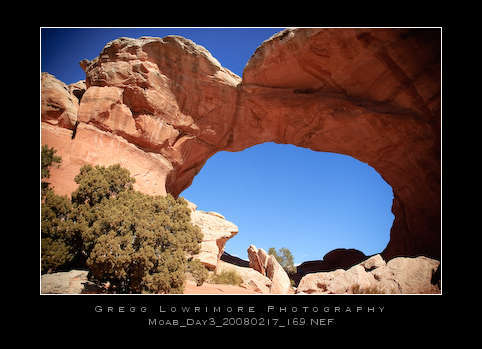 And since McDonald’s has the “arches”, we all laughed if this picture was used to begin our story about shooting in Arches NP. Ha-Ha. 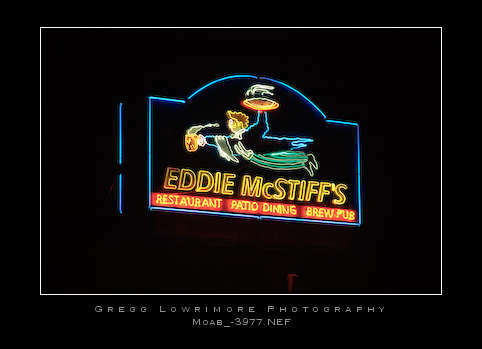 Dinner was soon found at the infamous Eddie McStiff’s Brew Pub. Decent food and good cold beer, but I kept getting the feeling I was in a Brokeback diner–something didn’t feel right in that place, if you know what I mean. Our condo was found off of a web site called: Vacation Rentals By Owner and turned out to be nicer than the hotels and cheaper overall! I highly recommend the web site for you next travels. We found a nice 3 bedroom, 2.5 bath condo just 4.9 miles south of the McDonald’s, out near the golf course. Nice and clean, with a fireplace. One thing about shooting in the winter months, is that sunrise and sunsets are a little more reasonably timed! And being somewhat close to the parks we wanted to shoot helped to ease the alarm clock sounding off at 5:15am each morning. Can you imagine doing this in the summertime? 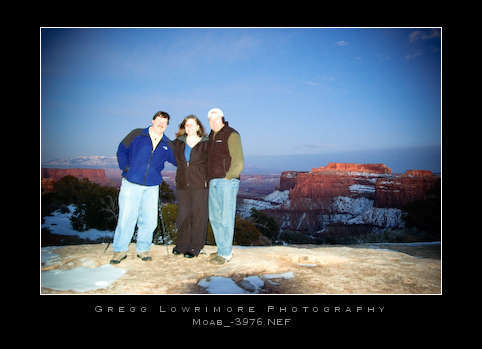 So we set our alarms for 5:15 after having decided to head out to Mesa Arch for sunrise. We timed the drive out of Canyonlands the night before and timed it so we could get back to the trailhead for Mesa Arch in time for 5:58am sunrise. 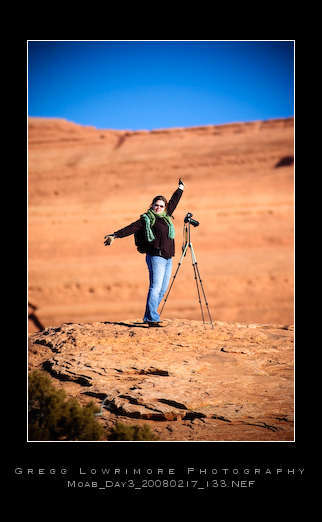 And upon arriving at Mesa Arch, ready to shoot, we were pleasantly greeted by 8 other photographers, all lined up in the “perfect” spot for the moment the sun broke over the horizon and illuminated the arch. Great, combat photography on our first morning out! We were able to squeeze in and take away some awesome shots, all things considered. 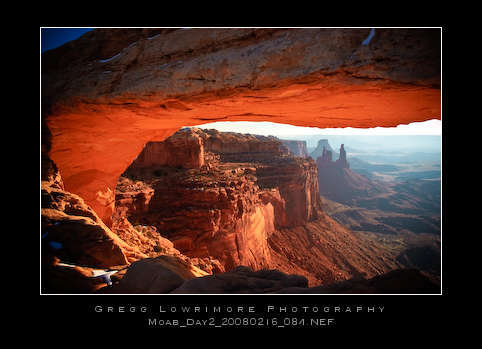 One of the strangest things about Mesa Arch was the other photographers–they shot the moments of sunrise, then they were gone. Not one of them spent time gazing out over the view or even bothered to wander around to see what other angles or images they could capture. Amazing to me, at least. 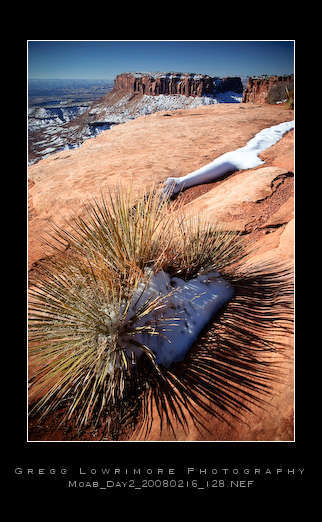 We spent two hours shooting at Mesa Arch and came away with some spectacular images. And after the initial sunburst over the horizon, we had the place to ourselves. The image below was taken after all the other photographers had left! The rest of the day was spent driving and hiking around the various vista points and trails along the main Canyonlands road. 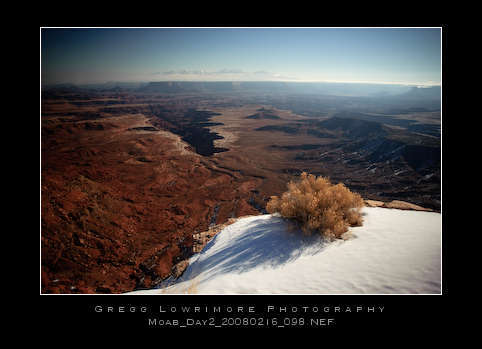 These images I shot at the Grand View point where we hiked out along the rim trail to about where you see me sitting on the rock ledge. Nice, easy (and safe) trails, as long as you stayed back away from the very edge! We talked to some of the other photographers that morning (and we ran into several of them throughout the day) about what they thought would be a good place to shoot the sunrise the next morning. One guy told us about Arches’ Courthouse Towers and it sounded really good. 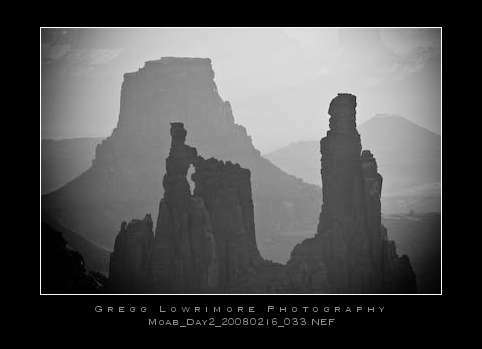 So the alarms were set again and Arches’ Courthouse Towers were the next day’s sunrise destination. In the photos above, we found the Three Gossips, the Tower of Babel, and Park Avenue and the Organs. Clouds covered the Eastern sky and the sunrise was delayed a bit while the sun rose up above the low horizon clouds, but I’m glad we stuck around. The shadow of the Three Gossips was just outstanding to view and shoot as it crept across the far wall, outside of Park Avenue. Our next stop was the world famous Delicate Arch, however we were not going to hike in via the back side as someone in our party had to go and sprain his ankle while scouting Dead Horse Point the night afternoon before! :) (Ed. Note: He and his ankle are doing great now! And he sure was a trouper to get out onto the trail as best he could for the remainder of the trip. If it was me, I would have stayed at the condo!) 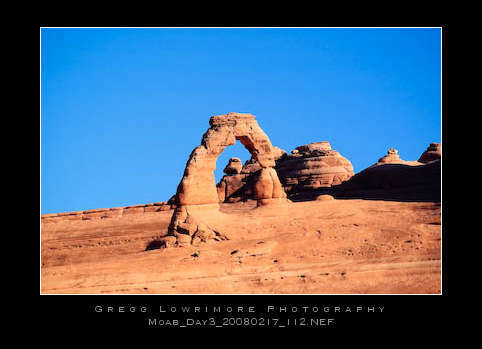 So we drove up to the lower viewpoint and hiked in from below Delicate Arch and what a view it was…. We really couldn’t assess scale until some other hikers came up over the back side and were standing around the base of the arch. I think Lori was just a little too thrilled to be out here shooting. After Delicate Arch, Steve drove us up to the campground near Devil’s Garden so that we could hike out to catch Broken Arch and told us he’d meet us at the other end of the trail. This turned out to be a nice fairly flat hike on super soft red sand and sage brush. Lori and I spent several memory cards shooting the Broken Arch (we both came to call it either Brokeback Arch or Cracked Arch, there was nothing broken about it though) from both sides and some of the huge spires found in that area before catching back up with Steve out at the trail’s end. 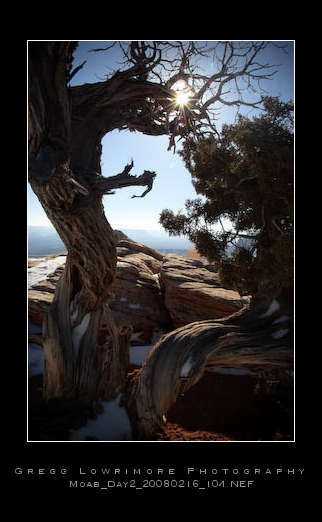 After heading out of the park to catch the Visitor’s Center for water, souvenirs and a short video presentation, lunch was served back in the Devils’ Garden area of the Park before the three of us ventured in to catch Landscape Arch. After Landscape Arch, we decided to kill some time before sunset, and found a 4×4 road that took off down into the valley between the main park road and the main highway into Moab. 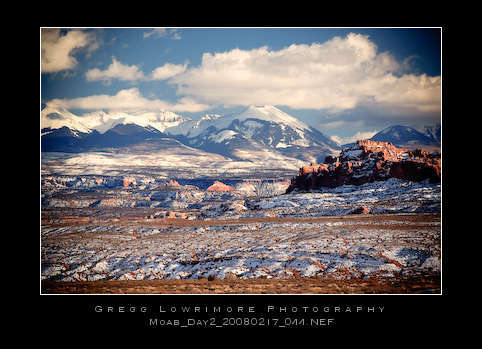 This shot was taken near the bottom of the valley looking back up at Balanced Rock, The Windows and the La Sal Mountains. 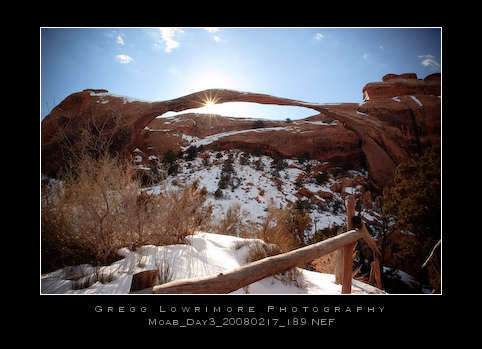 Along the way, we shot Skyline Arch in the 6 inches of mud on the trail! And got a closer view of the Balanced Rock area with the rising crescent moon in the background, all the while searching for a place to capture the setting sun that was quickly arriving. We got word from the Visitor’s Center that sunsets were good in the Windows area and at Double Arch, but upon arriving, we found the sunlight already too far gone to do the Double Arch any good. And heading into the Windows area, we found not much was photographically appealing, especially for sunset shots. Then while driving out of the Windows area, we found an overlook right at the Cove of Caves and decided to give it a try. It was about 50 feet off the ground and in perfect alignment for the setting sun’s rays. 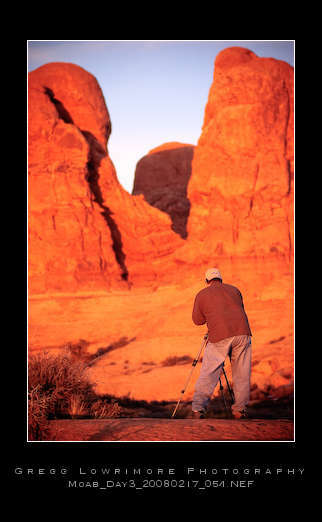 Below, I caught Steve shooting the Cove of Caves and captured his silhouetted form against a wall of fiery sandstone. 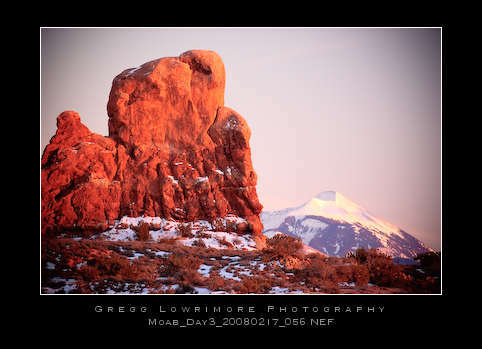 I then turned to capture some alpenglow on the top of Mt Pearle with a foreground of the right edge of the Turret Arch outcroppings. Beautiful colors! And we weren’t done there! We turned westerly and photographed a beautiful sunset. What a glorious end to a beautiful day! If you’re interested on the sunset shots, drop me a note and I’ll post some here. Dinner that night was spent reminiscing (and chimping) at the Moab Brewery. Guess where? Right next door to the McDonald’s. We talked about getting up one more time for sunrise the next morning, thinking that we could catch Mesa Arch again without 20 of our closet photography friends around, but, with Steve’s ankle black and blue already, and all of us being extremely tired from the driving and shooting 14 hours each of the two days, we decided to just call it good and head home the next day. That night, over a bottle of Gentlemen Jack, the three of us uploaded, organized and shared stories and images from the two and a quarter days. Overall, we want to head back there again. I estimate that we only covered about one-third of the what’s available to photograph in these two parks. 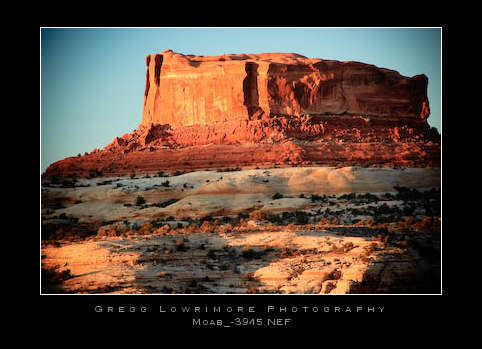 With the other two-thirds being in and around the Colorado River’s edge, looking up at the canyon walls, the Needles area and even further south, the Escalante area. Oh well. Have to leave something for the next trip! For the Gallery Album of this trip, please click the thumbnail below. And thanks for reading! 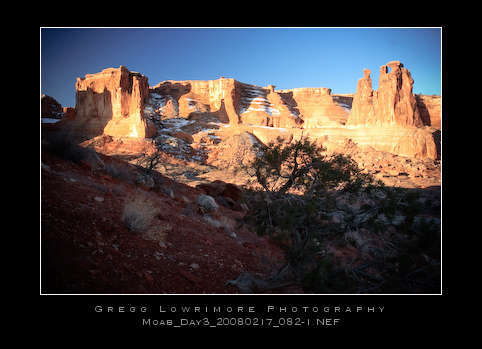 Posted in Shoots and tagged arches, Arches' Courthouse Towers;, balanced rock, Brew Pub, Brokeback Arch, Broken Arch, canyonlands, Canyonlands road, cold, colorado, Colorado River, Courthouse Towers, Cracked Arch, dead horse point, Decent food, delicate arch, devils garden, Double Arch, Eddie McStiff, food, golf, Google, La Sal Mountains, landscape arch, Lori Stone, McDonald's, mesa arch, moab, Moab Brewery, Mt Pearle, national park, Park Avenue, Seattle, Skyline Arch, Steve Parker, sunrise, sunset, Three Gossips, Tower of Babel, Turret Arch, utah, Visitor's Center by greggl with no comments yet.